Email askfuiping@gmail.com to buy Lingzhi to manage your Allergy. This article is put together from a seminar that highlighted various issues regarding Allergy and Immunity, which in turn was taken from Ganoderma Bulletin July 2004 issue. The information is gathered from the works of Prof Ling Bi Feng (nutritional immunology expert from Taiwan University Microbiological Research) and Dr Jiang Bo Lun (authority in pediatric medical immunology, Head of Pediatrician Department, Taiwan University). Th1 and Th2 (T Helper cells) are white blood cells that play an important role in our Immune System. The ratio for Healthy Adults should be High Th1, Low Th2. For Pregnant Women and Infants, the ratio should be Low Th1, High Th2. Allergens come in many forms, including dust, dust mites, seafood, beef, eggs, peanuts, mushrooms, perfume etc. When allergens enter your body, e.g. something you breath in through your respiratory tract - it will stimulate the growth of Th2 cells. Eosinophils (a type of white blood cells) will gather in your respiratory tract when they detect the presence of these allergens. Mastocytes (which are rich in histamines) will be stimulated, and release histamines and inflammatory factors, thus causing a lot of inflammation in your body (like redness, swelling, itchiness, hot feeling). 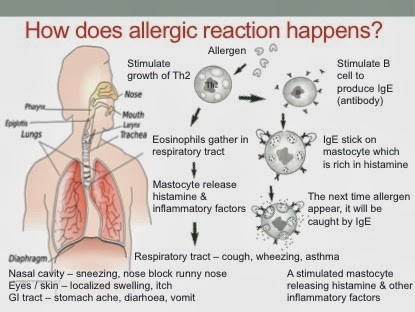 As the mastocytes are stimulated, and with the release of all the histamines - it causes allergic reaction. If the allergens go in through your respiratory tract, you may start coughing, then wheezing and eventually, may develop asthma. This is how asthmatic allergy reaction happens. At the same time, the growth of Th2 also stimulate B cells to produce antibody (IgE), which will stick onto mastocytes. So the next time this same allergen appears in your body, it will be caught by the IgE. For example, after you got chickenpox, you won't get it again because your body already has the antibody, so it will be prevented from infecting you again. Allergy is a series of reactions. As long as any one of this reaction is stopped, then allergy will be stopped as well, and symptoms will be lessened. The same allergen can trigger different kinds of symptoms / reaction. The same reaction may be caused by different allergen. One thing is common - the immune response going through your body remains the same. So even if you move to another country or don't eat certain things, the immune response will still happen. You will still get allergic attack, until you change your body constituents. The more times you have the allergic reaction, the more Th2 will be grown in your body. It will result in more IgE being produced. As you have more and more allergic reaction, the occurrence of allergy will be more and more frequent. The severity of reaction may become more and more serious. When it happens, it will stay on very long. Hence it's near impossible to cure allergy. When children first suffer from allergy, parents probably don't even recognise the symptoms. For instance, it's common for children to get food allergy. That's why allergic reaction usually show up in the GI tract (causing diarrhea) or on the skin of young children (rashes). It is quite common. As they grow up, the form of allergy may evolve, perhaps being triggered by something in the air - so now they get sinus, or asthma. It's not that they never used to have asthma, and now suddenly get it. But rather, it's the progress of an earlier condition which went unnoticed until they are older. Now as the reaction process still continues to happen, these young adults will continue to get allergic reaction. The only meaningful solution to managing allergy is to regulate this reaction. When you're already under attack, Lingzhi lessens the symptoms - reduce cough, improve wheezing, reduce phlegm, lessen asthmatic attack, relax the muscles, stabilise breathing. For better results, don't just rely on Lingzhi, as the symptoms take about 2 weeks to disappear. Take it together with doctor's medication. The good news is, before the symptoms completely disappear, people usually notice improvement in their appetite, sleeping pattern and energy level. It's found that Lingzhi's efficacy may not be directly targeted at the symptoms. But rather, it's more on overall regulating effect by bringing up the overall health level. Your defense system will also be better. When you can breath better, eat well, sleep well - don't you think your symptoms will be reduced? Mastocytes need to be stimulated in order to release the histamines. Lingzhi is effective in inhibiting the release of histamines - when histamines are not released, the allergic reaction won't happen. Lingzhi also reduces the stimulus on mastocytes. If it's not so active, then it won't release so much histamines. This is especially applicable on Lung and Skin allergy. If IgE is prevented from being over-produced, it won't lead to the whole chain reaction. Lingzhi also trains up Th1. If the number is high, whereby Th1 > Th2 - you won't get allergic reaction so easily. Th1 being high is important to keep Th2 in check. If you merely strengthen Th1 to overcome bacterial / viral infection, it won't help, if Th2 level is still high. You may not get infection but you will still get allergy. This is because your body constituent is not changed. You still carry that same type of allergic body constitution inside you. Even if you move to another country or change your environment, it is still inside your body. You can try to avoid the allergen but as you can't change what's inside you - your allergy is still there, waiting to be triggered. 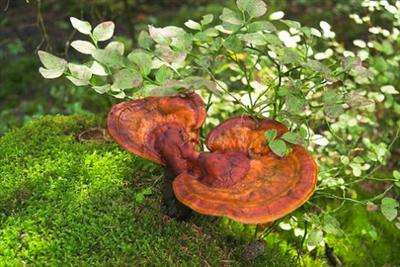 Long-term and consistent consumption of Lingzhi/Ganoderma is encouraged to change your allergic body constituents. If mummy has allergy, take Lingzhi during pregnancy to reduce chances of baby having it. Delay contact with food/substances which are prone to cause allergy, so you give your body time to train up and strengthen Th1. Strengthen your body to have optimum immune system where Th1 > Th2. Take Lingzhi on daily basis to reduce frequency and severity of attack, as well as lessen duration of attack. When under attack, take Lingzhi to reduce symptoms. A male who ate seafood during his teens acquired skin allergy. Later, the condition became very severe. However, consuming Lingzhi has completely healed him. He can even eat the same food that previously caused him allergy without any problem. 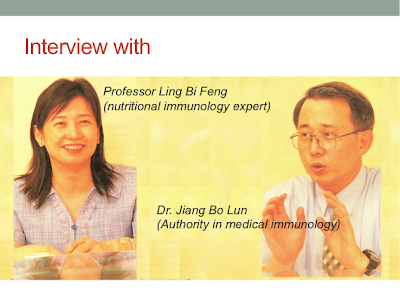 There are 4 cases with very good results reported after consuming Lingzhi. A lady worked in the textile industry. She breathed in a lot nylon fibre, injuring her lungs, and causing some form of asthma. She was healed after taking Lingzhi. A father has very bad eczema. His first son also suffers from eczema, as well as asthma. When the mother was pregnant with the second child, she consumed Lingzhi. When the son was born, he only had a little bit of skin allergy. A boy suffers from asthma attacks since 2-3 months old. When he was in Standard 2 and having another attack, his mother drove him to the front of clinic, stayed in the car, and fed him 3-5 Lingzhi every 5 minutes. His asthma attack completely stopped after less than 1 hour. 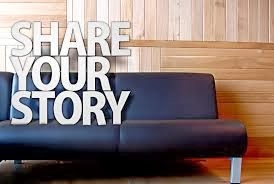 She didn't want to introduce anymore medication into her son's body. But she was worried in case anything happen while feeding him Lingzhi, hence feeding him in front of the clinic. Please email me at askfuiping@gmail.com to buy Lingzhi to manage your Allergy. Click here to refer to Shuang Hor company website for Product Description and Price.